I was bending over helping a customer retrieve some plants from a display when she interrupted me. “Excuse me,” she said, “I don’t want to tell you what to do but I am a physical therapist, and, if you want to have a ruptured or herniated disk in your back, just keep lifting like that.” That stopped me in my tracks, especially since my husband has had back surgery for a ruptured disk. Neither the rupture nor the surgery was a good time, as you may imagine. The physical therapist offered some pointers on lifting and bending and, boy, I listened. 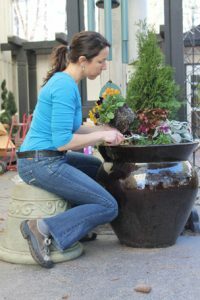 Backs are a staple in our industry and in gardening. Or, stand on one leg, hinge at the hip while the other leg goes out straight and back as your torso goes forward and down to retrieve or set down the object. 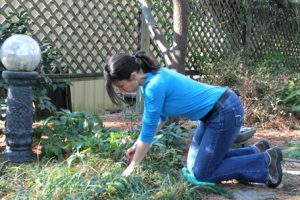 Taking care of how you move your body in the garden, or anytime, involves using biomechanics in your favor. Biomechanics literally translates as ‘life mechanics’ and involves applying the laws of physics to living things, in this case, our bodies as we move. Some of the basic concepts are ‘base of support’ and ‘center of gravity’. Your base of support is whatever part of your body is interacting with the surface that is supporting you. If you’re standing, it’s the area covered by your feet. If you’re sitting, it’s the area covered by your feet (if they’re touching the ground) and your buttocks. The wider your base of support, the more stable you are. Your center of gravity is dependent on how your body is aligned. If you’re standing, your center of gravity is typically the intersection of two lines: a line that passes through you from front to back through your navel and a line that passes through you from side to side that divides you in equal front and back segments. Keeping your center of gravity under your base of support adds stability to tasks such as lifting. Everyone has heard that they should ‘lift with their legs’ or ‘bend their knees’. That’s correct but make sure you don’t also bend your knees and trunk forward at the same time. This moves your center of gravity outside of your base of support, which invites injury and makes your body work a lot harder than it needs to. If you keep your upper body straight, over your base of support, you stand a much greater chance of avoiding injury. Notice that with all of these techniques the center of gravity stays over the base of support. And, the back stays straight which prevents repetitive stress on the joints and disks in the back. 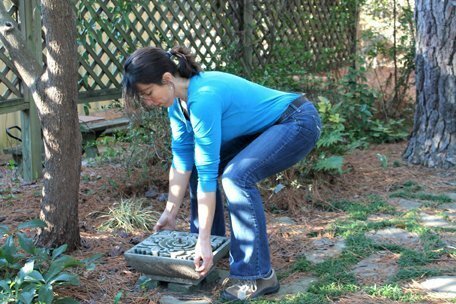 When digging, watch for lifting and twisting as you dig soil out of the ground. Try to move your whole body rather than twisting it, and try to use your lower body as you lift the shovel. Use a two-wheeled wheelbarrow for added stability. Bend at the knees, not the back, when you lift it up by the handles. I just discovered the Muletto, an all-purpose wheelbarrow that looks like a back saver. It’s going on my Christmas list. 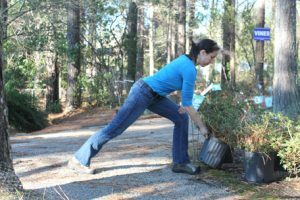 Don’t lift and twist, or lift things that aren’t close to your body like bags of mulch. Use your feet to turn. Keep objects that you are lifting close to your center of gravity. Try not to lift over your head. Photos courtesy of Tina Mast.